Part of James Cameron’s follow-up to the original, atmospheric classic that is Alien is very much Alien. It’s moody, despite the aggravating Pvt. Hudon (Bill Paxton). It’s about exploring the desolate planet where the species was first discovered, moving through hallways, and never knowing where the attack is coming from. Then the film splits, turning itself into the anti-Alien. It’s an action powerhouse, the Marines blasting away at the now named Xenomorphs, flamethrowers discharged with aggressiveness, and that acid blood hosted inside of the creatures only burning holes inside the complex or people when it’s convenient for the script. The change of pace is in many ways a disappointment, although it would admittedly be more difficult to recapture the same magic. Aliens is not just here to feature the alien creatures, but expand the universe. The corporate politics are a critical segment to the narrative, Weyland-Yutani not a company just handling shipping freighters. Their purposes and their politics are clear, not to mention their increasing disregard for human life. It does prove to develop a stronger backdrop to the action, the voracious creatures not the only threat on the planet. Carter Burke (Paul Reiser) is the perfect corporate lackey, completely lacking in sense, logic, or feelings. His goal is profits and bonuses at any cost. Many aspects of Aliens are familiar, Burke the replacement for Ash from the first film, the latter android programmed with the same goal. Both films begin and end in cryosleep. The finale concerns a timed run before the facility explodes, and Ripley finishes off the Alien with an airlock. That said, the film leaves little doubt that it can do those same things on a bigger scale, the Alien in question no longer the comparatively tiny soldier, but the Queen. This is an immense prop, brilliantly filmed to keep its origins as a prop bathed in darkness, with enough light focused to make its appearance felt. It’s the proper villain too, Ripley (Sigourney Weaver) now carrying an attachment to a little girl named Newt (Carrie Henn), orphaned after the Alien horde wiped out the populace. 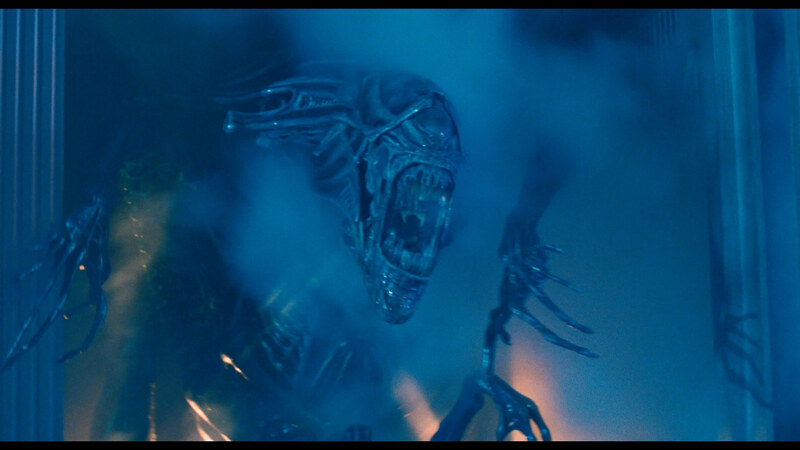 The Queen is much the same, launching a full-on assault only after Ripley wipes out the Xenomorph nest. Both carry their female instincts on their shoulder, assuming of course one could figure out which shoulder of the Queen’s that would be. There was some worry early on about this AVC encode, James Cameron making statements about de-graining the film. Those worries, thankfully, have been proven to be unfounded. This transfer for Aliens is immensely textured and detailed, revealing a pure, crisp image with only minimal softness. Most scenes involving a dip in the intensity of the image are purely focal issues within the source. Grain is well resolved, certainly on a lighter level than it has been in the past. Any digital drop in the film stock’s natural qualities have done nothing to the visuals themselves. This is a striking transfer from some of the the opening frames, from the frost that has attached itself to Ripley’s sleep chamber, to the striking facial detail as she wakes up. All of the characters carry that same level of definition, pores fantastically rendered, not to mention crisp and natural. Few close-ups ever seem diluted from this high standard, those few shots suffering from softness the exception. The same level of detail holds true for the planet, the alien-like mass that takes over the interiors of the colony rich with ridges and markings. Exteriors of LV-426, despite being cloaked with high winds and dust, still have some discernible texture to them. With all of the fast-tracking debris being strewn about, there are no compression issues to take note of. Under close scrutiny, the encode does reveal a minimal level of chroma noise, the grain structure producing some light spikes, the first one of note during Ripley’s initial chat with Newt. It is minor enough to be passed over by most. Black levels are the most disappointing aspect of this Blu-ray debut, failing to produce the same level of depth as the first film. They do vary in terms of their intensity, early blotting out some of the shadow detail, later appearing washed out and flat. It’s a constant back-and-forth battle to find the “right” levels, and there doesn’t seem to be a proper answer anywhere. As such, depth suffers as a result in certain scenes, lacking a tightly formed dimensionality. Purists will find fault with the new color scheme, the film now appearing more modern with brighter, oranger flesh tones. It is scene-dependent whether or not the effect becomes overly apparent and aggressive. The film has always carried a deep, cold blue look as well, but the blues here are certainly lighter than before. They lack an intensity and a depth, almost lessening the effect Cameron initially wanted. However, the transfer is up to date, vocally approved by Cameron himself, and certainly carrying the familiar look of current film. The end result is not pure, but different, giving the film a bit of added life as opposed to its drab, “classic” trappings. How much this effects you depends on how attached you are to the original, or how familiar it is in your mind. The color timing changes rarely seem terribly detrimental as the intensity ratchets up, certainly far less so than other forms of digital manipulation. Being such a wild, gun-happy sequel means greater opportunity to explore this DTS-HD mix. No doubt, there is little shortage of gunfire on display here, the futuristic guns lacking a weighty low-end, settling for a higher-pitched “ping” of sorts. This echoes naturally in the surrounds, although it’s impossible to count out the stereo channels. Listen as characters sweep guns across the soundstage, firing frantically. A natural pan is evident, providing a full separation between the stereos and the center. The same goes for the flamethrower Ripley utilizes for the end, the flames clearly sweeping front-to-back as the eggs go up in flames. What the guns lack in low-end ferocity by design, the APC makes up for it. As Ripley storms into the complex after the Marines are first attacked, the vehicle slams into the walls and smashes through doors, the effect practically taking over the entire mix. What the bass lacks in tightness and smoothness, it makes up for with sheer brute force. There is a slight volume balance issue at work here, the action definitely picked up compared to some of the weaker dialogue scenes, which probably need a small kick to become in line with everything else. Otherwise, the other elements balance well, save for those few bass jolts. The screaming of Marines as guns go off and Aliens screech while the music pounds along is fine. The score carries some fullness to it, certainly more up to date than certain dialogue exchanges. Most of the time, the dialogue is fine, carrying a natural air to it. The scene where Ripley tucks Newt in has a general harshness to it, the on-set sound effects seemingly elevated more than they should be. Some rather drastic popping is noted as Ripley talks around 1:20:54, the same lackadaisical fidelity of the previously mentioned conversation in place here as well. It’s brief. The disc of Aliens contains a commentary, this one recorded back in 2003. Two isolated scores are here, compressed but in 5.1, and only available in the original cut. The selection of deleted scenes are those re-inserted into the director’s cut, totaling nearly 20-minutes. The MU-TH-UR mode returns, the only real benefit being the pop-up trivia, and the intrusive on-screen graphics are barely worth the wealth of info. The rest of the extras reside on discs 5 and 6 in this set. Note: All time stamps refer to the theatrical cut.